Growing up bilingual, Diploma of Languages student Rosalind Moran was always able to appreciate the world around her from different cultural perspectives. Her experience living in France as a child ignited a passion for languages which she has been able to cultivate further since beginning her studies at ANU. 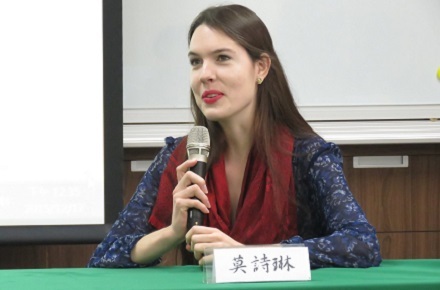 Now in her Honours year of her Bachelor of Philosophy (PhB), Rosalind knew from early on that she wanted to study both Mandarin and Portuguese, but realised it would be difficult to fit both languages in around her other study commitments. Enrolling in the Diploma of Languages in her second year helped Rosalind learn Mandarin the way she wanted to, without obstructing her PhB studies. As part of her Diploma, Rosalind joined an International Alliance of Research Universities (IARU) program at Peking University. She completed Chinese 1 prior to her arrival in Beijing, where she spent one month on the Banco Santander Scholarship. Rosalind returned home upon completion of the program, but it wasn’t long before she was heading abroad again. Midway through her third year, she began a nine month program at Taiwan National University on the Ministry of Education’s Huayu Enrichment Scholarship. “It was during my stay in Taiwan that my Mandarin skills really came together, owing to long-term immersion and the chance to develop a social circle using Mandarin. Rosalind’s language-learning experience in Taiwan helped her bridge the gap to return to ANU and enrol in more advanced courses. If you share Rosalind’s love for languages, check out the new multilingual section of Woroni, the official ANU student newspaper. Rosalind will serve as the editor of the multilingual section beginning 2017. Find out more about the Diploma of Languages here.